Posted	 January 26, 2016 by	Sikh Dharma International & filed under 06-Guru Hargobind, Community, Sikh History. by S.S. Gurukirn Kaur Khalsa, sharing her experience of this special holiday at Guru Nanak Dwara in Phoenix, AZ, USA. She also shares the history of the first Bandi Chhor Divas. Rather than being a sanctuary of tranquility, Gwalior Fort was really a prison where enemies of the state, including a number of Rajput princes, were detained. True to his nature, the Guru inspired them to join him in daily prayers and did his best to improve their conditions. In time, they came to revere him. The governor of the fort, Hari Dass, was a Sikh of the Guru and turned over to him a letter from Chandu Shah ordering him to poison the Guru. After the Guru had been in Gwalior Fort for several months, his Sikhs, including the ancient Baba Buddha, made the long journey from Amritsar to tell him how greatly they missed his presence. Although the Emperor had recovered, still the Guru was held captive. At this time, Mian Mir, a noted Sufi saint, traveled to the Emperor’s court and asked him to release the Guru. Upon his persuasion, the Emperor ordered Wazir Khan to free the Guru. Hari Dass informed the Guru of this fortunate turn of events; however, the Guru could not embrace his own fortune at the expense of the other prisoners and refused to leave the fort until all 52 of the Rajput princes were freed as well. When the Wazir Khan put the Guru’s condition in front of the Emperor, he initially refused it. It was only when the Wazir Khan reminded the Emperor that the Guru had saved his life that he relented. He added a condition of his own: in order to be released from the fort, each prisoner must be holding on to the Guru’s chola as he walked out of the prison gates. The Emperor was pleased with himself because he was sure that a mere handful would be able to fulfill this condition. Unbeknownst to him however, the Guru delighted in this challenge by having his tailor make a special chola with 52 panels attached to it. At the appointed time, the Guru donned the heavy chola, which stretched for yards behind him. The 52 princes each grasped a panel; 26 on the right and 26 on the left. Walking behind the Guru, careful not to let go, they stepped out into the sunlight and freedom, to the cheers of the Guru’s Sikhs. 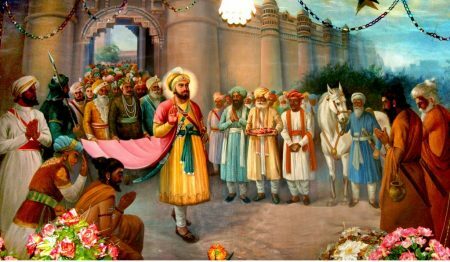 From this time on, Guru Hargobind was known as Bandi (prison) Chhor (liberator), and the day of liberation is celebrated as Bandi Chhor Divas (day). Several days later, when Guru Hargobind reached Amritsar, the Hindu festival of light, Divali, was being celebrated. In their joy at seeing their Guru again, the people lit up the whole city with candles, lights, and lamps. After almost four hundred years, this tradition continues in Amritsar, and on this day the Harimandir Sahib is aglow with thousands of candles and floating lamps, strings of lights decorate the domes, and fireworks burst in the sky. Elsewhere, at Gurdwara Sahib Guru Nanak Dwara in Phoenix and around the world, Sikhs commemorate Bandi Chhor Divas, Prisoner Release Day, by lighting hundreds of candles in the evening around the Gurdwara, singing shabads in praise of Guru Hargobind by Bhai Gurdas, preparing a festive Guru ka Langar, and basking in the spirit of joy and festivity.